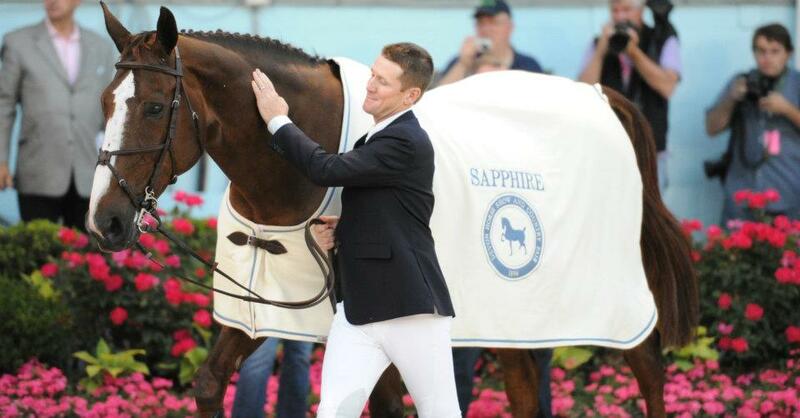 McLain Ward’s mare Sapphire died today from complications from colic. Sapphire, McLain Ward’s wonderful Belgium warmblood mare, died today from complications of colic. She was 19. Sapphire was retired in 2012 after injuring her check ligament after a stellar career that included winning two Olympic Gold medals. With a very heavy heart I have to share that Sara has passed away this morning due to complications from colic. Our entire Castle Hill family and every person she has touched has lost a great friend. Thank you Sara not just for all the dreams you made come true but simply for being who you were. You always will be my champion in every way. God speed good friend. One of her most memorable competitions was the jump off between Sapphire and Hickstead at Spruce Meadows in 2009, shown below. Truly a remarkable, once-in-a-lifetime mare. Condolences to her human family. 😦 I hate that both of these horses went to soon. Thanks for posting the video. Way too soon for both of these amazing horses. 😦 Makes me tear up to think of the sadness that the Ward family must be going through.